There’s no one right way to manage your diet. 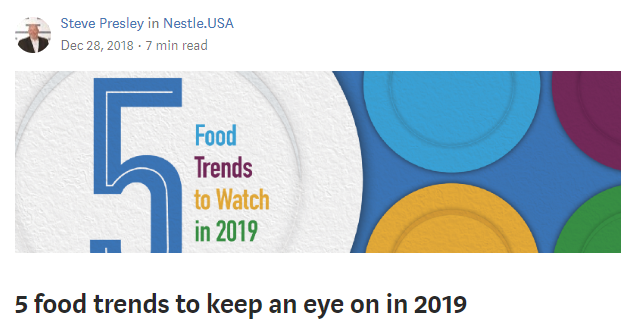 I should know — as a dietitian at Nestlé USA I’ve watched as consumer approaches to nutrition and health have evolved over the years. Today, you’re telling us that you want holistic health options that fit a range of lifestyles — from plant-based to protein-packed. At Nestlé, we’re meeting these consumer needs through a range of products such as vegan ice cream, allergen-free chocolate morsels, and gluten free pizza. 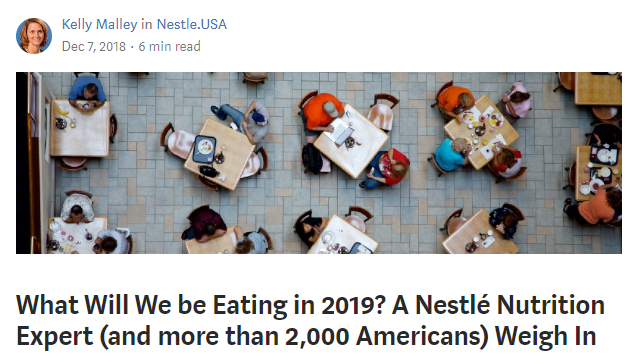 We’re not the only ones — I recently took a trip to Expo West, the world’s largest natural products trade show, and saw hundreds of companies offering products for nutrition-minded Americans. I kept an eye on the biggest trends at the Expo, and below are the 3 biggest stories I see shaping your kitchen cupboards in the coming years. Many Americans are enjoying a plant-based diet, or discovering they are lactose intolerant. Milk alternatives like coconut and almond milk have been around for a while, but increasingly we’re seeing a move towards oat milk as a dairy-free option. Oat milk was everywhere at Expo West. Made by soaking oats in water, then blending and straining the mixture, oat milk is very close to dairy milk in texture. Whether it’s in coffee, chocolate, or ice cream, you’re likely to start seeing oat milk used more and more in products on your grocery store shelves. 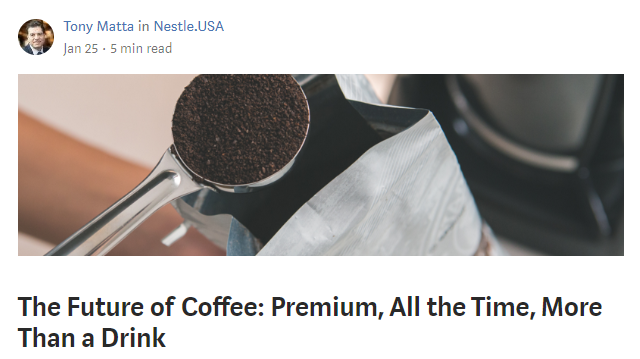 At Nestlé, our new Coffeemate natural bliss Oat Milk Coffee Creamer taps into the trend, adding a plant-based richness to your cup of coffee, and oat milk is also central to our new Nescafé Coffee Protein Smoothie offerings. Everywhere I looked at Expo West, I saw products that offer a sweet taste without added sugar — there was a full range of options from condiments to ice cream to muesli. So how do you maintain a sweet taste without adding sugar? By adding natural alternatives such as dates, sorghum, honey, monk fruit, and stevia — all of which are becoming increasingly popular options. Foods with reduced amounts of sugar and natural sweeteners, alongside the rise of keto — high-fat, low carb offerings — will keep drawing attention in coming years both at the Expo and on grocery shelves, as consumers put more of an emphasis on nutrition and wellness. The rise of food tribes — communities coming together around specific collective dietary approaches — give further momentum to this kind of nutrition trend. Here’s the thing though, as we improve nutrition of foods we’ve got to make sure they maintain great flavors. We’ve done the research, and we know that when it comes to choosing the foods you love, taste always wins. In fact, 93% of Americans say flavor is important when choosing a snack option. Having a food allergy prevents many people from enjoying a wide range of foods — but it shouldn’t. Food companies are increasingly focused on providing tasty, nutritious choices for the 32 million Americans with food allergies. Just look at the rise of the grain free baked goods and cauliflower crust pizza, innovations many of us hadn’t heard of just a few years ago. Since eight foods — milk, eggs, fish, crustacean shellfish, tree nuts, peanuts, wheat and soybeans — are responsible for 90% of all food allergies in the U.S., removing them from recipes and ingredient lists can make a big difference. So what have we been working on? With our Nestlé Tollhouse Simply Delicious chocolate morsels — which are free from the Top Eight food allergens — we’ve made chocolate chips, and chocolate chip cookies, available to more people with food allergies, and we launched new Nestlé Tollhouse Simply Delicious white morsels at the trade show last week! Food is not stagnant — today’s brand new idea could be the trend that sweeps America in the years to come. We know that your tastes are always evolving, and as they do we’ll be here to rise to the challenge of bringing you new innovative foods that are both tasty and nutritious. Keep an eye on your grocery store shelves for all the latest developments!